Explore the interactive map of Sharon’s Green (right) or visit Brent Colley’s Youtube channel (below) to take a walking tour of one of the green’s many landmarks. Click on one of the homes or buildings listed below for a detailed description and photographs. 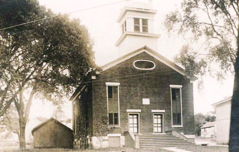 The first Methodist Church in Sharon was built on the west part of Calkinstown Road in 1808. 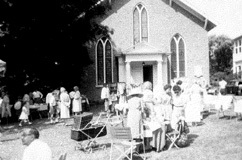 It served the community until the present church was built in 1835. Contemporary accounts speak of the 1835 church as the “costliest and most tasteful church of that denomination in Litchfield County. Alterations to the original building include new windows and changes in the aisles in 1882, and a chapel and Norman tower added in 1894 and 1904. The first Methodist sermon in Sharon was preached in 1788 by an itinerant preacher. His sermon greatly displeased townspeople not due to its content, but its location-in the local tavern! 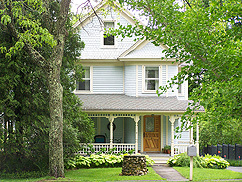 The history of this house is closely linked to that of 42 Upper Main Street to its immediate north. Known as the “Sedgwick Cottage” this building was part of the complex of structures owned by Judge Cyrus Swan and later, his son-in-law, Charles F. Sedgwick. It was sold in 1866 by Maria Sedgwick to Dr. William Knight. The records of the time refer to number 34 as “the office,” referencing a building that Judge Swan built as his law office shortly before 1814. Although it is tempting to date this house to an earlier period, based on land records cited by former town historian Jeanne Majdalany, a mortgage record on the property (cf. 34/207) indicates that the current house was probably built between 1866 and 1867 by William W. Knight. Records indicate that the law office was moved by the Wike brothers to their property on East Main Street on the southeast corner and incorporated into a house first occupied by Emmaline Palmer. 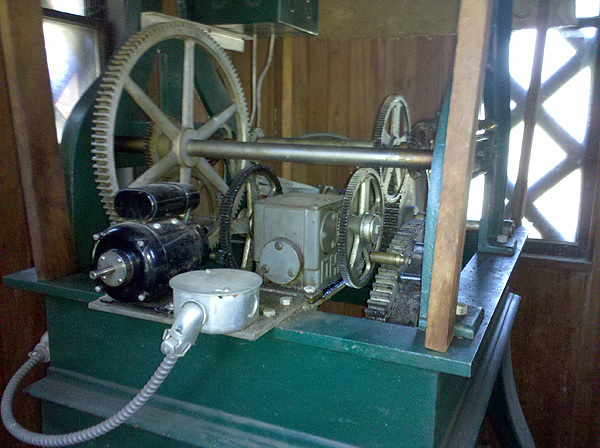 The outbuilding, now a playhouse, is called “The Ice House” and we are currently researching the origins of this name. Caroline Swan Sedgwick, 6th child of General Charles F. Sedgwick (B21,1) and Betsey (Swan) Sedgwick, was born January 22, 1839, at Sharon, Conn., and married September 5, 1861, Dr. William W. Knight of that place. He was born at Granby, Mass., July 11, 1833, attended the Berkshire Medical Institute and Lyceum of Medical History (this from its seal), from which he received a diploma in 1855. He was First Lieutenant and Assistant Surgeon of the 3d New York Volunteer Artillery. 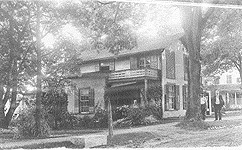 After the Civil War they resided at Sharon where he practiced medicine and kept the village drugstore. A nationally known resident of this house from 1935-c1955 was Percival Wilde, an American playwright and novelist. He is best known for his many one-act plays. Born in NYC around 1887, he attended Horace Mann School and Columbia University. His plays include “The Unseen Host” and “Design for Murder”. While in Sharon, he was president of the Board of Education and many Halloween pranks were played outside his house at 34 Upper Main Street. The Hotchkiss Library was built in 1893 by Maria Bissell Hotchkiss, the wife of the prominent local industrialist Benjamin Berkeley Hotchkiss who died in France in 1885, leaving a considerable fortune. The building was designed by New York city architect Bruce Price, although Mrs. Hotchkiss herself approved many of the final choices, including the color of the Stockbridge marble! Paintings of Maria Hotchkiss and her husband, as well as a bust of the great industrialist, carved by Moses Jacob Ezekiel in 1879, are on display in the building. Maria Bissell grew up in Salisbury and Sharon, and was a school teacher. She married Benjamin Berkeley Hotchkiss and lived in Sharon Valley, even after he went to live and work in Paris, France. When her husband died, she inherited his fortune. She was very generous and built and endowed the Hotchkiss School in Lakeville and the Hotchkiss Library in Sharon. One of the leading American ordinance engineers (gun and ammunition maker) of his day. As a young man, he worked with hisfather and brothers at the Hotchkiss Factory in Sharon Valley. He later worked in Hartford for Colt and Winchester rifle companies. After the Civil War, he went to Paris France to manufacture guns and ammunition for the French government. He died in France in 1885. Bruce Price, born December 12, 1845 and died May 29, 1903, was a very famous architect who designed many hotels and railroad stations in Canada and the United States. He moved to NYC in 1877 and married Josephine Lee. Their daughter, Emily Price, became famous as Emily Post, the author of many books on etiquette. Mr. Price was the architect chosen by Maria Bissell Hotchkiss to design the Hotchkiss Library. Known as the Gay-Hoyt House, the brick building was built in 1775-1776 by Lieutenant Colonel Ebenezer Gay of the 14th Militia, formerly the North Trainband. As the owner of a mercantile business and a tax collector for the town, Colonel Gay was a well-respected citizen. Unfortunately, he was forced to resign his commission in 1783 due to poor health and four years later he died insolvent. In 1793 Isaac Hunt purchased the property and it remained in the Hunt family for over 80 years. The Carter family then owned the house for 50 years, until it was sold to Anne Sherman Hoyt in 1936. Miss Hoyt, a past president of the Historical Society, bequeathed the house to the museum upon her death. Miss Hoyt, from Cleveland, Ohio, and New York City, had long summered in Sharon before she bought “the Brick House,” as she called it. She served as president of the Sharon Historical Society from 1939-1948. She served with the American Red Cross during World War I at several American bases overseas. She died in 1953 and bequeathed the house to the Historical Society for a museum. This building, built between 1813-1814 was the third Episcopal church built on or near this site. In early 1811, decisions were made to build with brick and to make the building either 40 x 45′ or 30 x 50′! The first full-time minister was hired about 1844, for $400 per year. In 1866 a meeting was held to consider building a parsonage; the year before a horse shed with stalls had been erected on the parsonage lot for the use of families attending services. In 1882-1883 improvements were made, including the addition of “16 feet to the west end of the church” and “cushions for the pews.” The organ was donated in memory of Mrs. Eleanor Wheeler McClurg by her sisters in 1905, and in 1908 new pews, pulpit, font and chandeliers were added in preparation for the church’s centennial festival held on May 27, 1909. In 1929 the paint covering the exterior of the church was removed, and in 1933 the old overhanging church porch was replaced. The church is noted for its stained glass windows, the earliest examples dating c.1882. Built between 1885 and 1886 and designed by NY city architects Lamb & Rich, in memory of Emily Butler Ogden Wheeler by her daughters. Emily Butler Ogden Wheeler and her husband, Judge Nelson Knox Wheeler had seven children. Their oldest son, William, bought a home in Sharon and brought many members of the family to town. Charles Alonzo Rich (b. October 22, 1854, died December 3, 1943) was an American architect who practiced in New York City from 1882 until 1933. Rich was a member of the Architectural League of New York. Rich was born in Beverly, MA, and died at his home in Charlottesville, VA at the age of 88. Mr. Rich designed the Sharon clock tower. Reed Gillette was an electrician in Sharon, and a descendant of the Gillette Brothers who owned the store at the north end of the green. Mr. Gillette electrified the clock tower in 1961-the clock which had been wound by Mr. George Marckres! This recently restored home was built as the parsonage for the Sharon Congregational Church on land “conveyed” to the Committee of the First Ecclesiastical Society at Sharon by Lemuel W. Marchant in 1877. This fourth building to house the First Church in Sharon was built in 1824. The first meeting house was built of logs possibly towards the north end of the Green in 1741. In 1742 a larger church supplanted the log one, and stood “opposite the tavern.” A much larger meeting house was built in 1768 and that site is marked by a boulder on the south end of the Green. The most important person in town between 1755 and 1806 was likely to have been the Congregational minister, Cotton Mather Smith. In 1939 the interior of the church was restored to its original design. The exterior remains much the same. Note the pair of portraits inside and the reproduction weathervane, replaced in spring, 2010. Mr. Pratt was the first minister called to Sharon to preach in the Congregational Church. He was a graduate of Yale College, class of 1736, and was called to the town in 1740. Unfortunately, Mr. Pratt had a drinking problem which caused trouble, and made him unable to do his job. He was fired in 1747. He stayed in town, but left and returned to Lebanon CT where he died. Reverend Cotton Mather Smith was ordained pastor of the Congregational Church in Sharon in 1755 and served there until he died on Nov. 27, 1806. He took care of people in the town during a smallpox epidemic when 700 people had smallpox in 2 months. He was a true patriot and was a chaplain to the army in 1775 during the Revolutionary War. This building was built by Mr. Mow between 1888 and 1890 for amateur photographer George Marckres. For a number of years beginning in 1968 the house was owned by Phillip and Maria Reep, professional singers who founded the Singing Hollow Operetta Company which enlisted people from the town as well as some professional friends to put on rollicking Gilbert & Sullivan productions. Mr. Reep opened a stationery store in the south addition which became a gathering place for townspeople. Today the building is home to WHDD, Robinhood Radio. 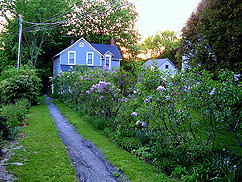 An earlier house known as the “Vine Covered Cottage” stood on this site until it was moved to the rear of the property in 1888 and used as a summer cottage until 1956 when it was taken down. Originally, the Vine Covered Cottage (c.1776) was believed to have been a part of the King House (12 North Main Street) and moved to this location when George King built the main house at 12 North Main in 1794. George Marckres came to Sharon with his wife, Marie, from Vermont in 1882. He opened a small store in the center of Town, next to the town hall. While he worked as a jeweler and a clockmaker, he is best known to us today as a photographer who chronicled the history of Sharon in pictures between 1882 and 1937 when he died. 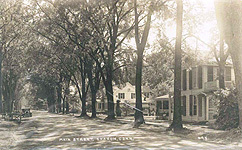 The north part of 109 Main Street was built some time before the related house at 113 Main Street, that is, before 1896. The northern first floor was constructed using square, handmade nails and undressed tree trunks instead of beams. The kitchen floor, made of very wide boards, is original from this time. 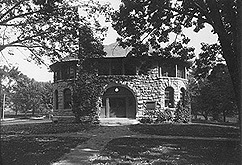 The southern addition was added in the 1920s or 1930s. It is reported that the owners of 113 Main lived in the smaller house while the bigger house was being built and, later when the bigger house rented out for the summer. While the small, original house may have started as an outbuilding of 99 Main, for most of the time it was owned as part of the 113 Main property. However, in the 1960s, the house was sold to Rosalie Prause, who had worked for many years at 113 for the Kraeley family. They sold it to her for “$1, with love and affection.” The two properties were recombined in 1997. Enter through #113 or down driveway of #113. 113 Main Street was built in 1896-1897. It was one of the first of 7 infill houses constructed on and near the Green by local builder William Mow from about 1896 to 1915. Mr. Mow lived next door at 119 Main Street, and this was one of his first houses. The exterior and interior millwork is from Dwight Eggleston, whose house was on Upper Main. An exception to the Eggleston millwork is the hand-carved spindles on the front staircase, perhaps a good example of an exuberant young builder testing his skills. Also notable are the rounded corners around the front entry, repeated on a number of interior corners. The house was built for mixed residential and commercial use. What is currently the dining room was the Town’s barber shop. In the 1970s it was used as a real estate office. Mr. Gustav Schwab, who lived in the house in the 1970s, was a descendant of the Wheeler family, many of whom lived in Sharon at one time. 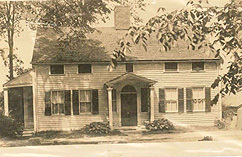 For many years the family owned four of the large houses on South Main Street, including 29 Cornwall Bridge Road (close to the clock tower), 27 South Main, 36 South Main, and 44 South Main. Known as the Abner Burnham house, this home was built between 1811 and 1813, by Burnham, a well-known clockmaker. In 1817 Burnham defaulted on his mortgage and the house, barn & “other bldgs.” were sold. Later the house became a tavern and after that, a dame school. In 1865 it was purchased by Redwill St. John Boughton and Jeanne Johnson who opened what became a prosperous millinery shop. Ladies came from as far away as Poughkeepsie to buy hats in the “latest Parisian style.” The house suffered serious damage during the Casino fire in 1925. Whiting White probably built this house here between 1810-1812. A beautiful Palladian window over the elegantly detailed and executed entrance portico, coupled with highly decorated over-window and door treatment of this house, are evidence of the highest quality New England craftsmanship. The finely detailed main cornice is also noteworthy. 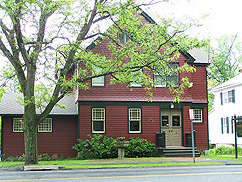 Much confusion has surrounded the history of this building, compounded by the fact that throughout early town records there is reference to an “old Academy” and a “new Academy.” In 1800 Cotton Mather Smith, long time minister at the Sharon Congregational Church, wrote that there was an Academy in Sharon. In 1806, when “the Academy” is mentioned in a mortgage deed by Judson Canfield, a wealthy Sharon resident and land owner, the building is located on the corner directly opposite the present clock tower. Later, in 1824, a town meeting was called to “assemble at the old Academy.” It is the belief of researchers in the 1990s that this statement infers that there was a “new” Academy in existence at the time. 119 Main Street is believed to be the new Academy. The best data indicates that the building was built as a school on the original house lot 25 near where the present Hotchkiss Library is. It was probably built in 1823 and moved to its present location between 1830 and 1831. William Mow, contractor in Sharon who was responsible for many of the current Victorian houses on the Green (including 113 and 41) owned the house between 1916 and 1951 and was probably responsible for many interior changes during that period. 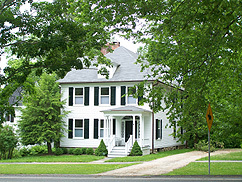 This house has been known throughout Sharon history as the “Nathaniel Skinner” house, but our best research tells us that it was probably built after Skinner divided and sold the property in 1742 to Joshua Gibbs of Wareham, MA. According to former town historian and researcher Jeanne Majdalany, in Sedgwick Notes of 1839, author Charles Sedgwick refers to “log houses in 1739” being common. Later, Lawrence Van Alstyne states that Nathaniel Skinner “probably lived near where Mrs. Patchen now lives (99 Main St.). Since both Nathaniel and his son Thomas sold their “houses” in 1742 for very little money, it’s probable that both buildings were torn down and a new house (99 Main) was built either by John Sprague or by Zebulon Badcock between 1744 and 1750. In spite of this confusion, the house remains one of the oldest in Sharon. Its wide, flush boarding on the Main Street façade, topped by the cornice containing a triglyph-meope motif reminiscent of classical Greece, exemplified the Neo-Classic period. As do many of Sharon’s houses, its dormer (possibly later) shows the Palladian influence. The transom over the front door is fan-like. The porches are later additions. Nathaniel Skinner drew the 26th Home Lot, and was first on the List of the proprietors of the common and undivided land, first magistrate, first town clerk, and first Deacon in the Church. In 1741 he sold “The Home Lot on which my dwelling house stands”, and by 1783 the south half of the property, with house, had been bought by Abel Patchin. Here he ran a “Publik House” until his death in 1805. The house remained in his family through his daughter, Betsy Patchin Chase, for 122 years until it became the home of Dr. Jerome Chaffee, founder of Sharon Hospital, in 1905. This house was probably built by Edward Gillette between 1862 and 1863. Charles Sears sold the property to Gillette in 1862, and the record states, “with buildings thereon standing.” A later sale to famous Sharon contractor I.N. Bartram indicates that the land “containing about one acre, house, barn and gardens.” The 1869 sale price was $5000. Isaac Newton Bartram, builder of the Sharon Town Hall and many structures in the region, may have purchased the property because it adjoined property he already owned to the west (on West Main Street.) Alas, he mortgaged the house to the Falls Village Savings bank shortly after the purchase of the property. The bank foreclosed on the property less than a month later. The bank owned the property until 1882 when it was purchased by Sarah C. Hamlin. She owned the house until 1897 when the property was sold to Hattie E. Dakin. It remained in the Dakin family, being transferred to Charles B. Dakin, until 1968. Interestingly, the property at 16 West Main Street (Sharon Package Store and florist, directly behind 91 Main Street) had also been held by I.N. Bartram, foreclosed on, and then sold to Sarah C. Hamlin in 1882, then to Hattie E. Dakin in 1897. The Dakin family operated a dry goods store in the building until c1969. 16 West Main Street was originally a full three-story building until a fire destroyed part of the building in 1899. 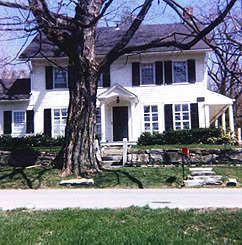 This house stands on property that was the western half of Ebenezer Mudge’s Home Lot, number 25. Mudge began to sell off pieces of the lot, including “52 acres including common land to the W excepting the SE corner on which my dwelling house stands” for 340 pounds sterling in 1742. In 1743 it was sold again to Capt. Samuel Hurlbutt, the first merchant in the town, “with all buildings standing thereon”, including the “Potash House”. Hurlbutt was a large land holder but died in poverty, a victim of the harsh post-Revolutionary era. The land was sold off in pieces to pay for taxes and debts, and in 1803 four acres became the property of Capt. Benjamin Lines. 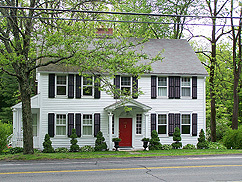 On them he built this beautiful example of colonial architecture, with fan windows on the gable ends and a Palladian window over the fan-lighted doorway. Underneath the kitchen is a cistern, the walls of which are built of hewn stone. Dr. Samuel Gager purchased the five acres where he built this home in 1801 from James Pardee, son of John Pardee who had purchased the land, approximately 49 acres, from John Bonton of Stamford, CT in 1741. Dr. Gager was born at Norwich, Connecticut, May 23, 1763, and was an assistant surgeon in the navy during the Revolutionary War. He established himself as a surgeon in Sharon in 1788. Long celebrated in his profession and as a leading citizen, he represented the town in the Assembly in the years 1821, 1822 and 1829. He also served as a justice of the peace. He died on August 4, 1835, bequeathing his property to his wife and son, George. Although unsubstantiated by research at this time, tradition has it that it was George Gager who planted the first elms on the Sharon Green. The Gager family lived in this house for 120 years. In 1910, Mrs. Wiley ran a tea room from the house which at the time had a wide front porch. When Isaac N. and Helen D. Bartram bought the property in 1879, it had changed hands 14 times and saw the coming and going of several important owners. As noted above, Philo Gould established a shop. Next, Joel T. Pettit, a young lawyer of great promise, bought the house from Gould and died a year later at age 27. Dr. John W. Smith owned it for more than thirty years. He rented the attorney’s office (later an apothecary’s store) attached to the southwest corner of his house to a lady named “Paulina.” She had permission to use the building as a schoolhouse for three years, and then move it if she so desired. Tradition says that when the Bartrams bought the place, they had the house moved back from near the road to its present position. As I.N. Bartram was a builder, was he the owner who removed the brick? In any case, the building was considerably altered by additions both front and back. In 1910, the house – named “The Bartram” – was defined as a large dwelling or boarding house. The two cottages and barn behind it are also mentioned. Joseph Gallow sold a half acre to Joshua Bassett in 1791, but then re-sold it “as purchased of Bassett” in 1796 to David Parsons of Vermont. 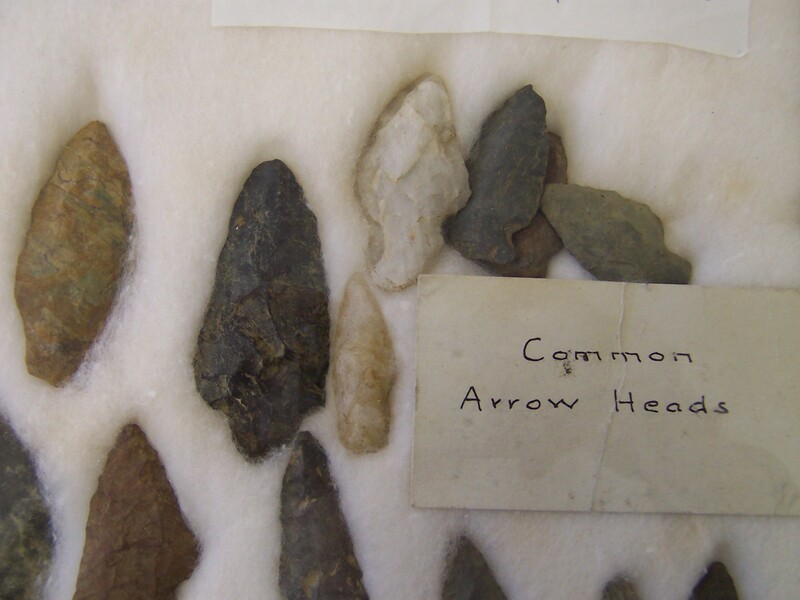 It was described as being a few rods north of the meeting house with a house and a stable. 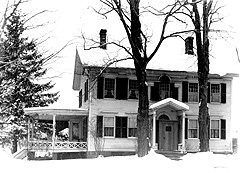 This house was bought in 1827 by Charles F. Sedgwick, who lived there until he moved next door after his father-in-law’s (Cyrus Swan) death in 1835. The Reverend Grove L. Brownell, a Congregational minister, next occupied the house (1841-1857) and established his “select” school there. It accepted students from as far away as New Haven and charged $2/week for room and laundry. 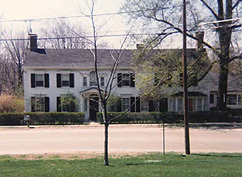 The Sharon Historic District Study Report in 1975 stated that a letter exists from the parent of a student, writing to complain of the cost of the room and board. A letter in response is quoted as follows: “considering the maternal care Mrs. Camp [the landlady] will have with regard to your daughter” the price was not excessive. Reverend Brownell was the pastor of the Congregational Church from 1840-1848, he died in 1855. Early 19th century photographs show the home much as it looks today, although graced with an elaborate front porch, with a gambrel rood and attractive window detail. It is highly likely that the house is very much changed from the original building that Bassett built, especially since both Sedgwick and Brownell were men of considerable standing in Sharon. This property has changed hands many, many times throughout its history.